Purchase a 1Gbps HSNS connection with a SLA and CIR. Buy a pair of Ubiquiti airFiber 24GHz radio's. Purchase some space on a tower/building. Set up the radio link. 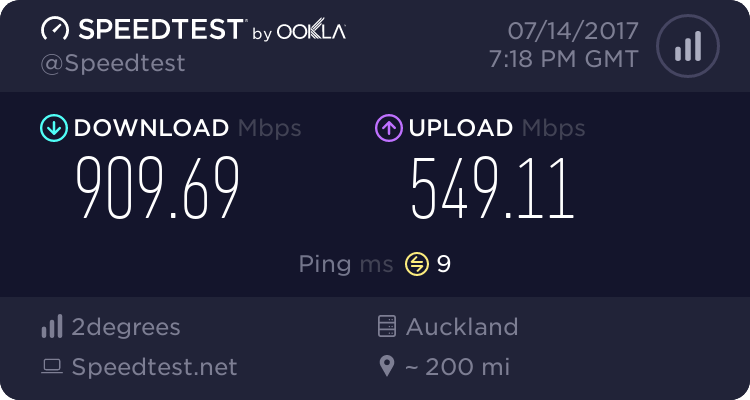 Do speedtests all day to show people how cool you are. Settle down everyone. This is why Geekzone should have age limit - for 9 years old+ only. As already mentioned, it requires more bandwidth/spectrum and therefore higher costs. 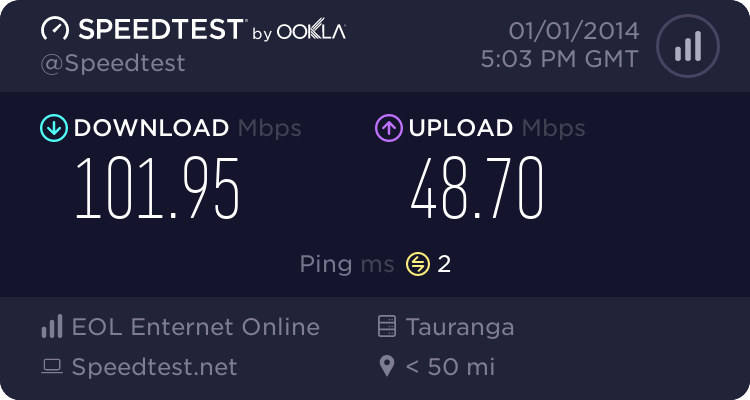 Although I noticed the WiMax upgrade to speed in 2011 from what I can tell, only requires a doubling of bandwidth, which compared with the leap from 40 to 1Gbps is way more efficient use of spectrum. But I'd imagine there'd be more customers in the end not more speed to exsisting customers since that's where the $$$ would be. Sidenote: My local taxi company uses Toyota and Honda hybrids (Nissan Sunnies cost less). If they owned a lamborghini though I'm sure they could make a business case for celeb's and long distance airport trips for them since the local costs $300-400 for a 3 hour drive to Queenstown. Compared to the bicycle, cars were a really expensive idea back in 1886. However, the hyrids are more efficient and cost less in the long term. I would think WiMax2 would fall in to this bracket - higher investment but long term payback in terms of efficiency (more users) should be higher? /me predicts another thread started asking another question on a similar vein very shortly. networkn: /me predicts another thread started asking another question on a similar vein very shortly. can we get that in writing as one would say? Why does my car have a speed limit? It's amazing how vicious geekzoners can be when slightly annoyed. Give the guy a break, he's learning. We were all there once. Nobody is forcing you to read this thread and reply with dry snark. ripdog: It's amazing how vicious geekzoners can be when slightly annoyed. I appreciate it. I know an OK amount relating to phones and the technologies involved and desktop PC's are something I have an understanding of but the whole broadband thing like how cabinets work how wireless works, etc is something I clearly do not get.